In the early history of Siamese, there is a tendency to view the contribution made by the stud males, almost to the exclusion of that made by the females of the variety. But there were a small number of very good quality females, who were both successful on the show bench, as well as being brilliant brood queens. These are the ones who left behind them, litters containing kittens that would in their turn, make a significant contribution to the overall establishment of the breed. Two queens fulfilling these criteria were 'Champion Eve' and her dam, 'Polyphema'. The risks associated with showing were not to be underestimated. 'Show fever', as distemper was invariably called, was a very real threat, and many an excellent specimen was shown, only to return home to die. The subsequent losses, and the cost to the fledgling breeds, were inestimable! And this was the sad reality of showing breeding stock. At some shows, classes were cancelled due to the lack of entries, mostly caused through the fear of entering after experiencing or witnessing instances or a period of loss. In these times, before the development of vaccines or microbe specific disinfectants, only the cats with the very best of constitutions could be shown multiple times and the risk of exhibiting kittens, with barely developed immunity, was considerable. An early example of the cost in Siamese, were the progeny of 'Pho' and 'Ma', direct imports from the Palace in Bangkok, belonging to Mrs. Lilian Gould. 'Duen N'gai' was born to this pair in March 1885, and 'Kalahom' and 'Kromata', in July 1885. All three were shown at the Crystal Palace Show of that year and afterwards, all died. Another was 'Koschka', from 'Ch. Wankee' and 'Klinkie' born 16th May 1899, a superlative specimen who was shown at Westminster in 1900 and who died shortly afterwards. It was as a brood queen that 'Eve' created her most lasting legacy. Yet despite these disappointments, the dedication of these early breeders won through, and it is thanks to their sheer determination and hard work, that we can count the Siamese today among the most popular breeds on the planet. 'Eve' was born in February 1899, bred by Lady Vyvyan, from 'Tiam O'Shian III' and the beautiful 'Polyphema'. This breeding was a direct double-up (Father to daughter breeding), based on 'Tiam O'Shian III', as he was already the sire of 'Polyphema'. Not long after the formation of the Club, a decision was taken to write to Fur and Feather, to draw attention to what the Club members saw as the "unfortunate diversity of opinion concerning Siamese cats expressed in articles which appear from time to time". The letter then explained that one great object of the Club was to encourage the breeding of the 'Royal Cat of Siam', and also the 'Chocolate Cat of Siam', "both beautiful in their own way, but recognised as distinct breeds." 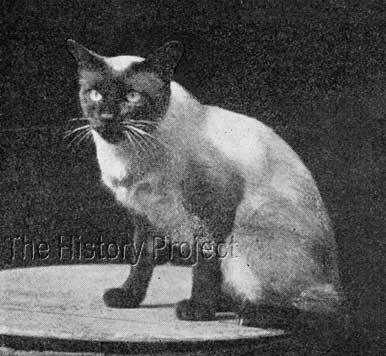 It should be remembered that at this time, the 'Royal Cat of Siam', was a fully pointed blue eyed cat, and the Chocolate, was a lighter mid-brown cat, with only slightly darker points and yellow eyes. Mrs. Backhouse, was one of the notable signatories to the letter. 'Eve' is in excellent and famous company with her full siblings, but she can claim the distinction of being the oldest, being born from 'Polyphema's' litter of February 1899. She was also the first of 'Polyphema's progeny to gain her Championship. 'Tiam O'Shian', of course, was widely used, but sad to say, despite this few, if any, of his own lines have survived to this day, but the combination that produced him, lives on in the progeny from his older sibling, 'Eve', who as the dam of 'Bandoola', is the forebear behind 'Prince Vudighi' and thence to 'Litabois', who may consequently be found behind most Siamese of today. 'Ah Choo', younger sibling to 'Ch. Eve'. Unfortunately, there are no records of surviving progeny from either 'Ah Choo' or her litter sister, 'Suzanne'. Of Dam half-siblings, there is only the litter from 'Polyphema' and 'Ch.Wankee' born on 8th February, 1901, which included the three males 'Tamagno', 'De Reszke' and 'Van Dyke' (Van Dyck), as well as the female 'Nada'. However, none of these left any registered progeny.? Although a strikingly handsome and successful female on the show bench, it was as a brood queen that 'Eve' created her most lasting legacy. We can find five kittens in all from 'Eve', all sired by 'Ch. Wankee', but only two with a verifiable date of birth. These were 'Boojum', (a male), 'Bandoola, (a female), 'Sin Jin', (a female), and 'The Bogie Man' (a desexed male), the latter being born 7th April, 1900.5, and 'Ayah', (a female) born in August, 1901. 'BANDOOLA', also retained by Mrs. Backhouse, and eventually mated to 'Boojum II' produced 'Ch. Prince Vudighi'. 'SIN JIN', also retained by Mrs. Backhouse, for whom we have no verifiable progeny. 'THE BOGIE MAN', who was desexed , and became the pet of Rev. P.L.Cosway. Regretfully, no images can currently be found of any of 'Eve's progeny. 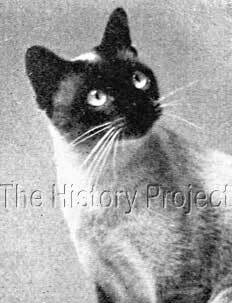 'Prince Vudighi' , and hence, 'Boojum', 'Boojum II' 'Bandoola', 'Wankee' and 'Eve' may all be found on the pedigrees of many of today's Siamese, a great many coming down from the sons and grandsons of 'Prince Vudighi', through cats such as 'Litabois' and 'Bigabois' to name just a few. 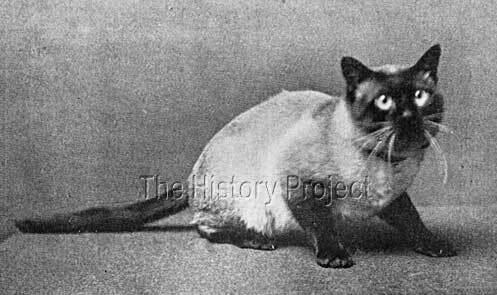 But without any doubt, it was only 'Eve', of ALL the progeny from 'Polyphema' and 'Tiam O'Shian III', that truly contributed to the furtherance of the Siamese breed and its establishment as a pillar of the Fancy. We are confident that Mrs. Backhouse would agree.